If you could travel to three MLB ballparks that you’ve never been to before, which would you go to and why? Make a mental note of your top three. Go ahead. I’ll wait. Okay now I’m going to see if I can predict your answers. Either Fenway Park or Wrigley Field. Usually the other one: Fenway or Wrigley. But potentially Yankee Stadium, Camden Yards, Dodger Stadium or AT&T Park. Always a mysterious wild card. It’s almost comical how consistent the answers have been. Obviously, everyone wants to hit the historic venues, but they also consistently include a curveball based on mostly curiosity and very little knowledge of the stadium. There’s no real reason for the interest, they’re just intrigued. It’s mysterious to them, but they feel pulled for some reason. Were two of your three choices in the first two points? The most common response I get for the third one: Safeco Field, home of the Seattle Mariners. There’s something intriguing about the Mariners for a lot of fans. Seattle isn’t anywhere close to any other MLB team – the nearest are Oakland and San Francisco, 800 miles away – and I think people just mostly forget about it. TV networks are way more likely to show a Dodgers or Giants or Angels game than a Mariners game, and even if they’re on late, nobody on the east coast is going to stay up until 1 or 2AM to watch. I wonder if Felix Hernandez gets less coverage than he deserves because he’s on the Mariners. I wonder what will happen now that Robinson Cano is there. Seattle is actually closer to Tokyo than it is to Miami. Okay. No it’s not. But raise your hand if you kinda believed it at first. I actually had to go look it up myself – Tokyo is 4800 miles away and Miami is only 3300 miles – but the point is that I wasn’t even sure. It feels like a different country to some of us. 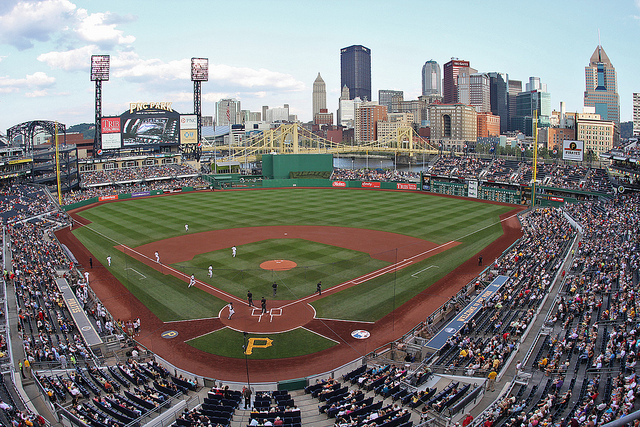 Another one I get a lot: PNC Park, home of the Pittsburgh Pirates. Now this one has an obvious explanation: the Roberto Clemente Bridge. Every time there’s a Game Break on whatever Fox Sports affiliate you watch, there are only a few stadiums that truly stand out immediately. PNC Park is one of them. Every highlight has that giant yellow bridge in the background, and it sets it apart from the rest of them. Besides, deep down, I think we all like the Pirates because we all sorta feel sorry for them. Until last year, they’ve been so bad for so long that it’s difficult to have any negative feelings about them anymore. Ok, be honest, how am I doing? Was that it? PNC? Imma regular David Copperfield, amiright? The third answer I get a lot: Minute Maid Park, home of the Houston Astros. The reasoning behind this one is similar to PNC Park, I think: it’s immediately recognizable on TV because of the train track that runs across the left field exterior wall and that goofy little hill in center field. It’s intriguing. Not that anyone wants to see the Astros play anymore – the team lost 111 games last year – but there’s something about it that speaks to us. Welp. How’d I do? Did I get all three? * – Except Oakland or Miami. Those could be considered wrong answers, actually. What I’m getting at is this: the primary destinations of interest are compelling for cognitive reasons. By that I mean, we know we want to go there because we have knowledge of the histories involved. We know that Fenway and Wrigley are the oldest, so we know they need to be at the top of our list. We know that the Yankees, Dodgers, Orioles and Giants have history and traditions that we ought to experience. But then something in us wants to solve a mystery or quench our curiosity. Our imagination somehow kicks in by the third answer and completes the list with a quirky third option. It leaves open the possibility for adventure or a solved riddle. We’ve seen something that caught our interest on TV and we want to investigate. So maybe the question to ask is not whether I was able to correctly guess your top three ballparks you want to visit. Maybe what I’m attempting to solve is how you constructed your top three. I’m guessing I at least got that part right. All that to say, what three would you pick? Which three ballparks are you most interested in visiting? Next Next post: BOOK PROJECT: FUNDED! !